Chief Keef may be "Finally Rich" — as the title of his first album proclaims — but the teenage rap star won't be able to spend most of his big-money paycheck until he turns 18 in August, DNAinfo.com has learned. Chief Keef signed a three-album contract — and a separate deal to control his own record label — with Interscope Records that could pay the South Side gangster rapper more than $6 million over three years. A split of future royalties could make for an even bigger payday, according to court papers. The terms of Chief Keef's record deal were made public in a Cook County chancery court filing that seeks a judge's approval for the rapper to finalize agreements with Interscope. 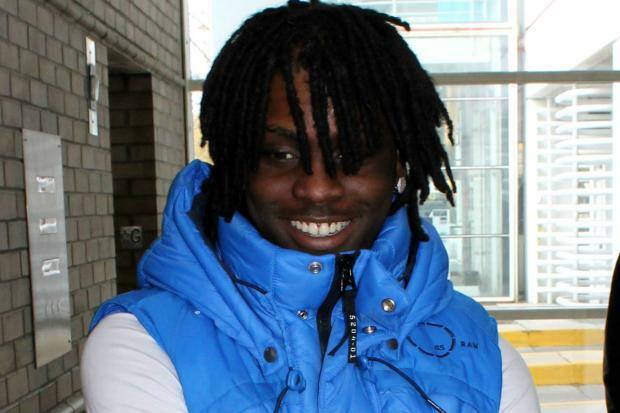 Court approval of the contracts is required by law because Chief Keef, 17, is a minor. Interscope agreed to pay Chief Keef a $440,000 advance — half up front and half after a judge signs off on the deal — that will be deposited in a court-administered trust fund on his behalf, according to court papers. The so-called "blocked trust" is controlled by Chief Keef's legal guardian, his grandmother, Margaret Carter. Withdrawals typically are prohibited from block trusts until a minor turns 18. Chief Keef — who currently is locked up in juvenile detention for 60 days — also received at least $300,000 to cover the cost of recording "Finally Rich," which sold 50,000 copies during the first week it was released in December. Chief Keef's deals all depend on album sales. If "Finally Rich" doesn't sell at least 250,000 albums by December 2013, Interscope has the right to pull the plug on subsequent album releases — two albums and a compilation of hits, according to the deal. In a separate three-year deal to establish Chief Keef's record label "Glory Boyz Entertainment" — GBE for short — Interscope Records forked over another $440,000 advance. That agreement calls for both Chief Keef and his manager, Rovan Manuel, to each be paid $180,000. The deal calls for 15 percent of Chief Keef's advance to be put in his trust fund, according to court papers. The GBE operating agreement calls for Chief Keef and Manuel to each own 40 percent of the record label, a subsidiary of Interscope. Derrick Coleman, who raps under the name Fredo Santana, was paid a $40,000 advance and received 10 percent interest in the label. Chief Keef's uncle, Alonzo Carter, and Anthony H. Dade also each hold 5 percent ownership of GBE, according to court papers. The contract also calls for Interscope to pay GBE $200,000 for "overhead" expenses, which include office, travel, entertainment and "salary cost" and additional money for marketing, according to the contract. GBE and Interscope will split profits equally. Interscope Records, however, can terminate the Glory Boyz deal if losses exceed $4.5 million, according to the contract. Despite Chief Keef's plea for "one more chance," a Cook County judge last week ordered the rapper held in juvenile detention for violating his probation on charges he pointed a gun at Chicago police officers. On Jan. 16, the mother of the rapper's daughter filed a motion seeking immediate temporary child support for the girl. The toddler, who Chief Keef calls "Kay Kay," has a song named after her on "Finally Rich." She also makes a cameo appearance in the rapper's YouTube video for the song, "They Know." Chief Keef is set to appear before a judge on his probation violation on March 14, when he could be released from custody. A judge is set to rule on the Interscope deal on April 16.